The thread has a breaking strain of around 9.3 pounds (4.2 kilos). 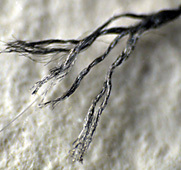 It comprises roughly 96 individual filaments, each coated with a micron-thick layer of natural silver. 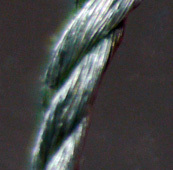 In construction, 16 of these filaments are wound together to form an initial twist; two of these twists are then twisted together, and finally three of these twists are combined to form the finished thread. In thread terms, it's around 18 denier. In terms understandable to me, it's a little heavier than a regular sewing thread, but not as heavy as an upholstery thread. It can be sewn on most domestic sewing machines using either a regular needle or the next size up. This thread does not fray. As far as I can tell, there are no loose ends of filaments except where they have been cut. 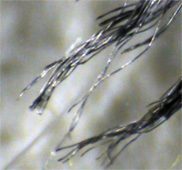 The filaments are very smooth, so there are no fine tendrils as you will find with a cotton thread. This used to result in a lack of cohesion in the thread, resulting in "bunching" at the needle when machine sewing; this is no longer the case.